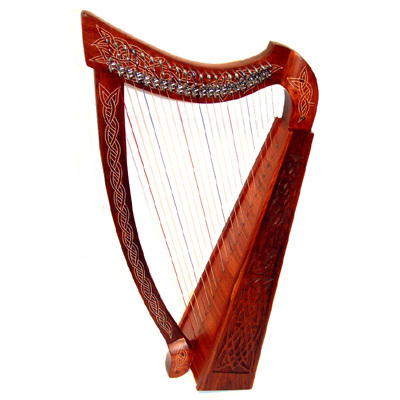 The 22 string Heather Harp is an inexpensive, but substantially built Celtic lever harp. This harp is an ideal starter instrument for those wanting to get started before investing in a larger, more expensive harp. The harp is made of Rosewood with a laminated soundboard, has semi-tone metal levers, a painted Celtic design and traditional style carvings. The harp is nylon strung and is supplied with a slightly padded canvas bag, tuning key and spare set of strings.